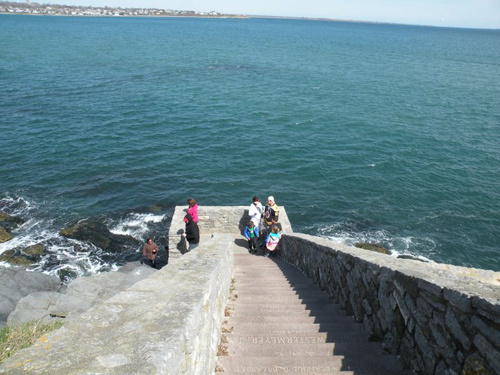 One of the most popular Newport RI attractions, the 40 Steps have been a gathering spot for servants, locals and tourists for the better part of the last two centuries. If you're looking for a great spot to enjoy the Atlantic Ocean and watch the waves crash into the rocky coast, there are few better than this one. Just don't forget your camera! 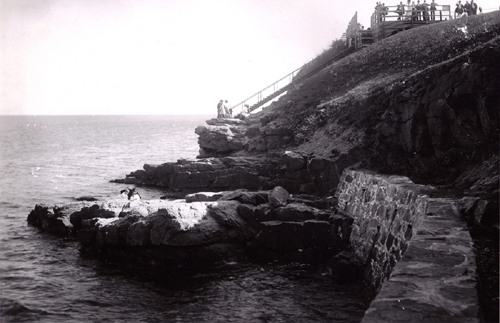 Located less than a mile from the start of the beautiful Newport Cliff Walk (at the east end of Narragansett Avenue), the 40 Steps used to be one of the most popular recreation spots for the servants who worked at the Newport mansions during the Gilded Age. I'm sure there wasn't much time off for these immigrants, but when there was, they enjoyed themselves here with dancing, music and stunning views of the Atlantic Ocean. 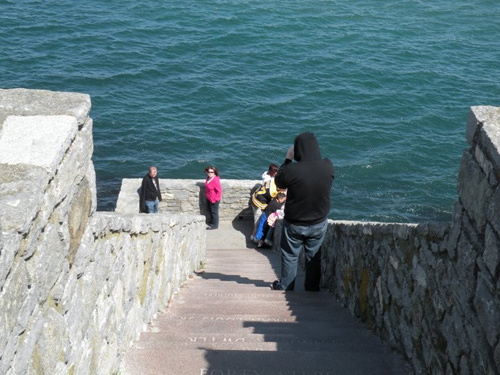 Originally built sometime in the early 1800's, the 40 Steps were restored in the early 1990's, making them more attractive and much safer. 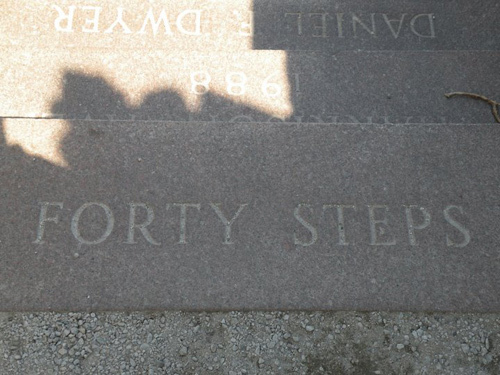 The new granite steps are courtesy of the Forty Steps Restoration Fund and bear the names of donors who spent $3000 each for their step. 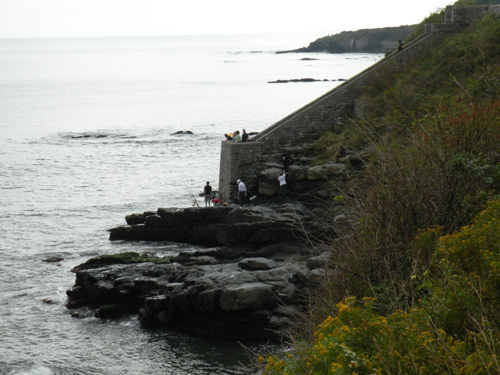 This is one of many great locations in Newport for both swimming and fishing from the cliffs. If you're going to climb, fish or dive here, be very careful. The rocks can be very slippery, the waves a little rough and people have lost their lives here. Have fun, but be safe! If it's a little too cold for swimming or fishing, or if you're just not feeling adventurous, just enjoy the view and take a few pictures. The 40 Steps are open from dawn to dusk. Drive east on Narragansett Avenue. At the very end are the 40 Steps. 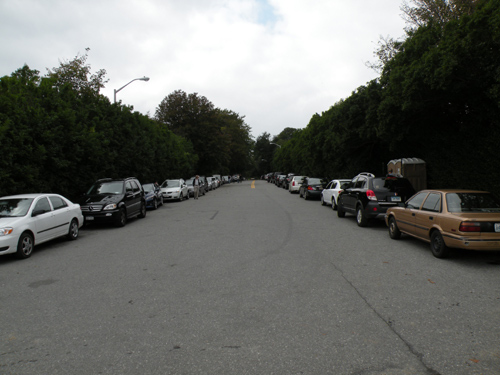 There is free parking on both sides of the street, and even a Porta Potty if nature calls. 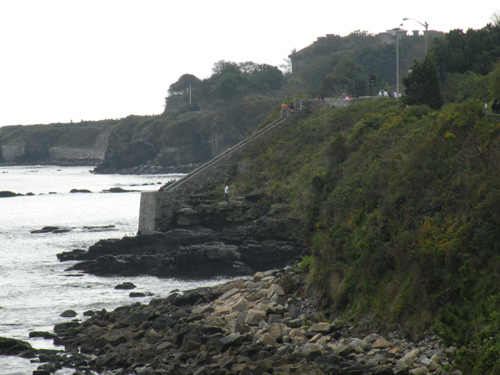 Start at the beginning of the Newport Cliff Walk, on Memorial Boulevard (overlooking Easton's Beach). RIPTA bus route #67 from the Newport Visitors Center takes 11 minutes to get you to The Breakers mansion. From there, you just walk a little north on Ochre Point Avenue. Take a right onto Narragansett Avenue, and the 40 Steps are at the end of the street. Once you're done enjoying the view from here, continue south along the Newport Cliff Walk and check out some of the amazing Newport mansions, starting with Ochre Court (below). 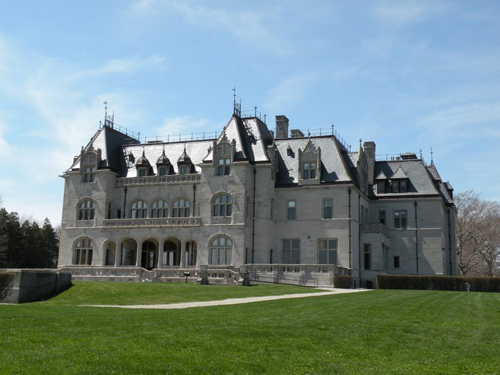 I think you'll understand why this is one of the most popular Newport RI attractions, once you've seen it for yourself.